Mar 23, 2018 Municipalities on Greenland as large as the whole of France. Five countries whose economies, if combined, would be the world’s twelfth largest. Cities where 62 percent of the labour force work in knowledge intensive businesses. The Nordic region is all of this. The report ‘State of the Nordic Region’, published every second year, is a fascinating reminder of just how different things can be in a region which from the outside appears homogenous. Feb 08, 2018 Norway's government is calling for a joint initiative for youth inclusion. A laudable initiative. But government ministers should also look at the underlying structures if their measures are to achieve more than papering over the cracks. Perhaps we need to think differently about how to combine education and work. Dec 05, 2017 Nordic labour inspection authorities still have some way to go to perfect their methods for identifying businesses for inspection. But critics who imply that these authorities lack the will to seek out risk, are off target. Oct 23, 2015 “I don’t believe anyone in any government office fails to think about refugees,” says the new Director for the Norwegian Labour and Welfare Administration (NAV) Sigrun Vågeng in the Portrait. The numbers arriving to the Nordics have broken all predictions and colour societies and their public debate. Mar 06, 2015 For the fifth year running the Nordic Labour Journal publishes the gender equality barometer. The division of power in the Nordic region is better than ever, but not across the board. This year we focus on religious societies, generally ruled by men. Nordic churches are different, with women as top bishops in Iceland, Norway and Sweden. But does power equal authority? Feb 07, 2015 Stop worrying and join the debate about a legally binding minimum wage across the EU. That’s the bombshell from Bente Sorgenfrey, the new President for the Council of Nordic Trade Unions, NFS. Is fear for the debate the real problem, or is a statutory minimum wage a real threat to the Nordic model? The Nordic Labour Journal kicks off the debate in this month’s theme. May 08, 2014 On 22 May 1954 the agreement on a joint Nordic labour market was signed. 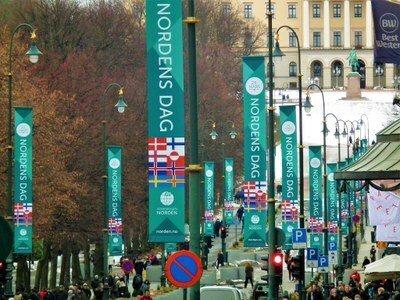 60 years on the Nordic Labour Journal talks to Nordic citizens who in each of the six decades tried their luck in a different Nordic country — and we look at how the agreement came to be. Nov 07, 2013 Part time work is one of the most important issues in the Nordic gender equality debate. The gap might be narrowing, but women still work more part time than men. This is a question of money, culture and morals, but where lecturing might not be the best tool if you want to change things. Oct 09, 2013 Lets get a Vision Zero for workplace accidents! That’s the conclusion in the report ‘Young workers’ working environment in the Nordic countries’, which forms the basis for this month’s theme. Sep 13, 2013 What can get more young people into work? Where are the successful experiences that shows it pays to give young people a chance in working life? Everyone shares the same goal: getting people into work while maintaining an efficient use of taxpayers’ money, says Sweden’s Minister for Labour Hillevi Engström in this month’s theme. Jun 19, 2013 How do you achieve job engagement and work commitment? In this summer edition of the Nordic Labour Journal our writers, experts and researchers explore what happens with job engagement when work pressure increases. Does job engagement really equal increased productivity? Is job engagement pure gold? Editorial: What to do with the youth? May 23, 2013 Make no mistake: youth unemployment is foremost in Nordic politicians’ minds. Especially NEETs, young people not in education, employment or training. They make up between five and ten percent of Nordic youths. But what will politicians do for them? Apr 16, 2013 What do you do if your colleague works twice as long at half the pay that you get? There are trades and individuals who gravely exploit cheap labour, and in times of crisis many will accept a lot in order to get a job. What is being done in the Nordic region to make sure labour market rules are being followed? The fight against social dumping is this month’s theme in the Nordic Labour Journal. Mar 08, 2013 The Nordic Labour Journal’s gender equality barometer, the third in as many years, shows progress for women’s representation in Nordic power positions by one percentage point in 2012 in relation to a 50/50 gender distribution. Feb 08, 2013 Iro came first. She arrived from Greece to study. Then the crisis hit, Iro found a job and stayed. Now her brother Dimitris has joined her to look for work in Norway. Do they represent a wave of job seekers from crisis-hit southern Europe to the Nordic region, we wonder in this month’s theme. Dec 14, 2012 Whatever happened to the Nordic negotiation model? people asked as news broke that SAS employees were told to accept longer hours for less pay or see the airline go bust. Nov 15, 2012 Are the big media corporations panicking in the face of changing media habits when redundancies spread across the industry? Falling classifieds revenues, budget cuts and fewer readers are shaking Nordic newspaper houses. Jobs are cut across the board and senior writers take early retirement, bidding a sad farewell after serving society for many years. What is happening?